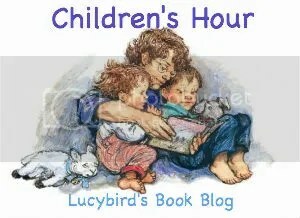 WATCH OUT LATER TODAY FOR A CHILDREN’S HOUR GIVEAWAY! Commotion in the Ocean is more of a series of poems than a story really. Each poem is about a different sea creature, or set of sea creatures, and they all rhyme. This book was a big hit about a year ago in Toddler Room, and our bathroom display based on the book (with pictures copied but decorated by the children) is still a bit hit. The rhymes are funny and have beautiful accompanying pictures. The rhymes make it easy for the children to remember the names of the different sea creatures, and they can sometimes quote them. The pictures are big and bright, and there’s lots of background for the children to investigate, including a starfish to find on every page. Commotion in the Ocean is written by the same author as Giraffe’s Can’t Dance, I prefer the latter but both are big hits with the kids.